It has been a while since these pages "visited" organs local to the Birmingham area, so for this and next month we feature two important - but very different - local organs. 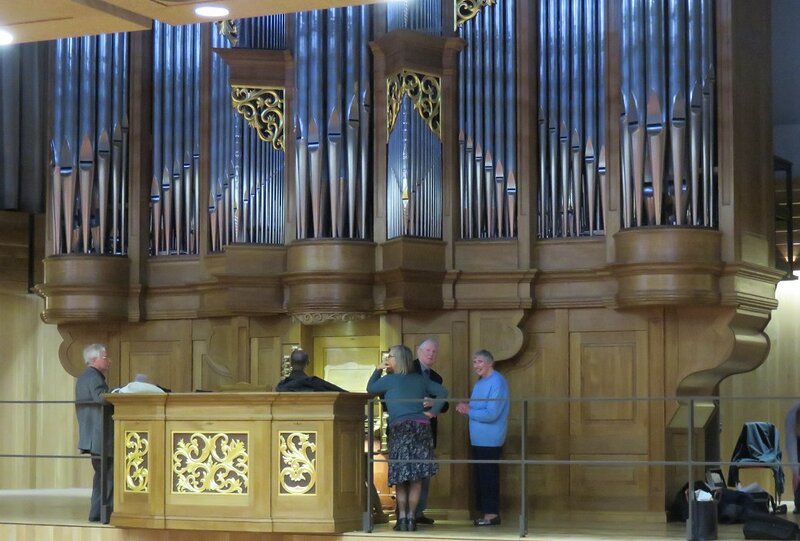 Earlier this year, members of the Birmingham association were invited to the Bramall Music Building of the University of Birmingham to hear and play the new organ by French builder Marc Garnier in the Elgar Concert Hall. Our host was Head of Organ Studies at Birmingham Conservatoire, organist to Birimingham University, and BOA member, Henry Fairs (left), who was closely involved with the installation of this landmark instrument - the first Garnier organ in this country. In reality, there are two organs here. The main instrument (see right photo), a three-manual with mechanical action but electric stop mechanisms and a sequencer, has a mildy unequal temperament and is tuned at A=440. 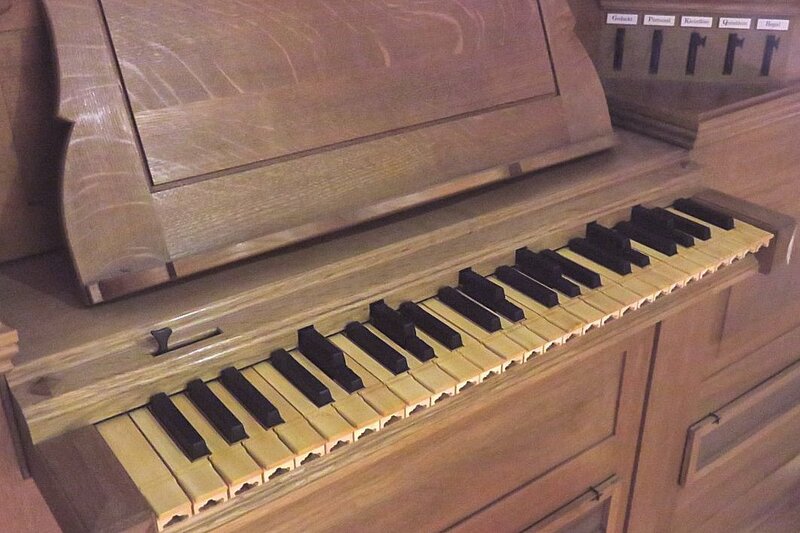 The chair organ, played from a single manual sitting at which the performer faces the audience, uses A=415 meantone tuning, with some accidentals split (see centre photo) to provide for precise D# & E♭ and G# & A♭ pitch: rather confusing for the majority of us only used to keyboards designed for equal temperament! Even the main console feels slightly alien with (narrower) keys to baroque dimensions and a parallel flat pedalboard. Henry explained that the organ is most useful as a teaching instrument for students who may be preparing to play continental organs, especially those of the North German baroque school. 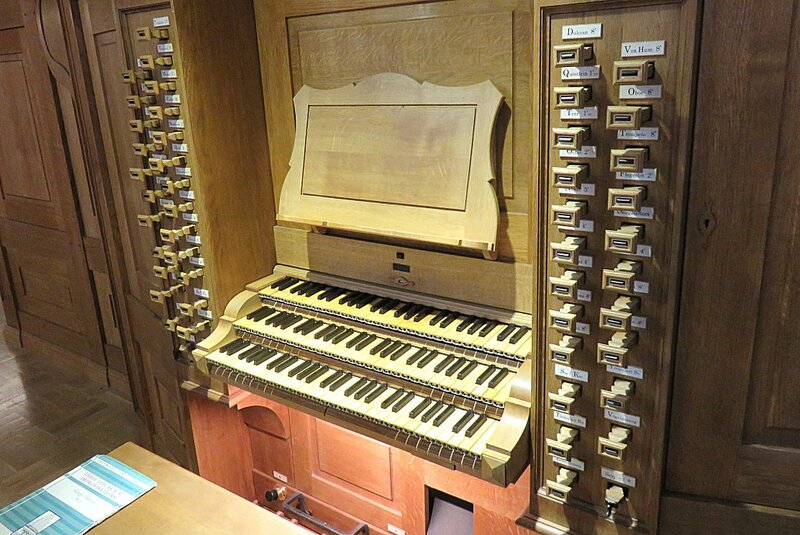 You can listen to an almost half-hour audio recording of Henry Fairs playing at the organ's 2014 opening recital as September17's Music of the Month.